Ecosystems are controlled both by external and internal factors; they can be both resistant or resilient to ecosystem disturbances. Biotic and abiotic factors interact through nutrient cycles and energy flows. External factors control resource inputs and are not influenced by the ecosystem itself. Internal factors are processes that exist within the ecosystem, such as decomposition, succession, and the types of species present. While in equilibrium, an ecosystem can recover from small changes through negative feedback, returning to its original state. Resistance describes an ecosystem’s ability to resist disturbances to the ecosystems dynamics. Human disturbances to ecosystems can overwhelm the ecosystem’s resilience, crippling its ability to return to equilibrium. An ecosystem is a community of living organisms (plants, animals, and microbes) existing in conjunction with the nonliving components of their environment (air, water, and mineral soil), interacting as a system. These biotic and abiotic components are linked together through nutrient cycles and energy flows. As ecosystems are defined by the network of interactions among organisms, or between organisms and their environment, they can be of any size, but usually encompass specific, limited spaces. Ecosystems are dynamic entities controlled both by external and internal factors. External factors, such as climate and the parent material that forms the soil, control the overall structure of an ecosystem and the way things work within it, but are not themselves influenced by the ecosystem. While the resource inputs are generally controlled by external processes, the availability of these resources within the ecosystem is controlled by internal factors such as decomposition, root competition, or shading. Other internal factors include disturbance, succession, and the types of species present. From one year to another, ecosystems experience variation in their biotic and abiotic environments. A drought, an especially cold winter, and a pest outbreak all constitute short-term variability in environmental conditions. Animal populations vary from year to year, building up during resource-rich periods, but crashing as the food supply becomes scarce. Equilibrium is the steady state of an ecosystem where all organisms are in balance with their environment and with each other. In equilibrium, any small changes to the system will be balanced by negative feedback, allowing the system to return to its original state. In ecology, two parameters are used to measure changes in ecosystems: resistance and resilience. Resistance is the ability of an ecosystem to remain at equilibrium despite disturbances. Resilience is the speed at which an ecosystem recovers to equilibrium after being disturbed. Humans may impact the nature of an ecosystem to such a degree that the ecosystem can lose its resilience entirely. In these cases, external human influences can lead to the complete destruction or irreversible altering of the ecosystem equilibrium. Human intervention in ecosystem equilibrium: The Australian Aboriginal practice of “Fire-stick farming” has fundamentally modified Australian ecosystems. The legacy of this practice over long periods has resulted in forests being converted to grasslands. In this example, the forests became less and less resilient over time until the fundamental system equilibrium had changed. In 1993, a change in ecosystem dynamics caused a disease outbreak in a human population. In May of 1993, an unexplained pulmonary illness struck inhabitants of the southwestern United States in an area shared by Arizona, New Mexico, Colorado and Utah known as “The Four Corners. ” A young, physically fit Navajo man suffering from shortness of breath was rushed to a hospital in New Mexico and died rapidly. After further investigation, state officials located another five young, healthy people who had all died after acute respiratory failure. Although they identified the virus as the cause of the disease, researchers did not understand how it was transmitted. The researchers trapped and examined rodents that lived in and around the homes of the victims, and found that almost 30% of the deer mice were infected with the Sin Nombre hantavirus. The virus had been transmitted to humans via aerosolized mouse droppings, and a dramatic increase in the deer mouse population increased human infection rates. The Four Corners area had experienced a drought until early 1993, when there were heavy snows and rainfall. The end of the drought caused an increase in vegetation, and particularly pinon nut production. With the sudden increase in food supply, the local deer mice population exploded and reproduced so rapidly that there were ten times more mice in May 1993 than there had been in May of 1992. The higher population of deer mice meant more mouse droppings and more opportunities to transmit hantavirus to humans. Ecosystem dynamics can affect human populations: The Four Corners area had been in a drought for several years. In early 1993, the rainfall caused an increase in vegetation, which caused an increase the local deer mice population. Hantavirus infected the high deer mouse population and was quickly transmitted to humans via aerosolized mouse droppings. As part of the effort to locate the source of the virus, researchers located and examined stored samples of lung tissue from people who had died of unexplained lung disease. 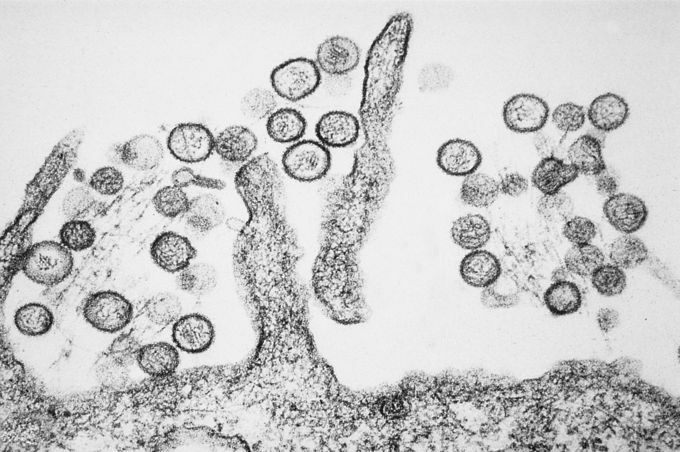 Some of these samples showed evidence of previous infection with Sin Nombre virus, indicating that the earlier cases of the disease had not been recognized. The Navajo Native Americans recognize a similar disease in their medical traditions, and associate its occurrence with mice. A food web describes the flow of energy and nutrients through an ecosystem, while a food chain is a linear path through a food web. 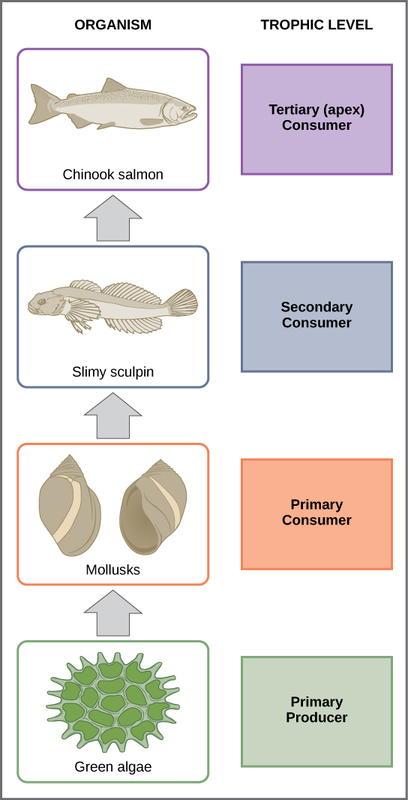 Organisms can be organized into trophic levels: primary producer, primary consumer, secondary consumer, and tertiary or higher-order consumer. Energy decreases in each successive trophic level, preventing more than four or five levels in a food chain. An ecosystem usually has two different types of food webs: a grazing food web based on photosynthetic plants or algae, along with a detrital food web based on decomposers (such as fungi). There are different types of food webs including grazing food webs based on photosynthetic plants (such as algae) or detrital food webs based on decomposers (such as fungi). In ecology, a food web describes the feeding connections between organisms in a biotic community. Both energy and nutrients flow through a food web, moving through organisms as they are consumed by an organism above them in the food web. A single path of energy through a food web is called a food chain. In both food webs and food chains, arrows point from an organism that is consumed to the organism that consumes it. In many ecosystems, the bottom of the food chain consists of photosynthetic organisms, such as plants or phytoplankton, known as primary producers. The organisms that consume the primary producers are herbivores: the primary consumers. Secondary consumers are usually carnivores that eat the primary consumers, while tertiary consumers are carnivores that eat other carnivores. Higher-level consumers feed on the next lower trophic levels, and so on, up to the organisms at the top of the food chain, which are called the apex consumers. Some lines within a food web may point to more than one organism; those organisms may occupy different trophic levels depending on their position in each food chain within the web. Food web: This food web shows the interactions between organisms across trophic levels in the Lake Ontario ecosystem. Primary producers are outlined in green, primary consumers in orange, secondary consumers in blue, and tertiary (apex) consumers in purple. The opossum shrimp eats both primary producers and primary consumers; it is, therefore, both a primary consumer and a secondary consumer. It is rare to find food chains that have more than four or five links because the loss of energy limits the length of food chains. At each trophic level, most of the energy is lost through biological processes such as respiration or finding food. Only the energy that is directly assimilated into an animal’s consumable mass will be transferred to the next level when that animal is eaten. Therefore, after a limited number of trophic energy transfers, the amount of energy remaining in the food chain cannot support a higher trophic level. Although energy is lost, nutrients are recycled through waste or decomposition. Food chain: These are the trophic levels of a food chain in Lake Ontario. Energy and nutrients flow from photosynthetic green algae at the bottom to the salmon at the top of the food chain. There are only four links in this chain because significant energy is lost between each successive trophic level. A scientist named Howard T. Odum demonstrated the loss of energy in each trophic level in the Silver Springs, Florida, ecosystem in the 1940s. He found that the primary producers generated 20,819 kcal/m2/yr (kilocalories per square meter per year), the primary consumers generated 3368 kcal/m2/yr, the secondary consumers generated 383 kcal/m2/yr, and the tertiary consumers only generated 21 kcal/m2/yr. 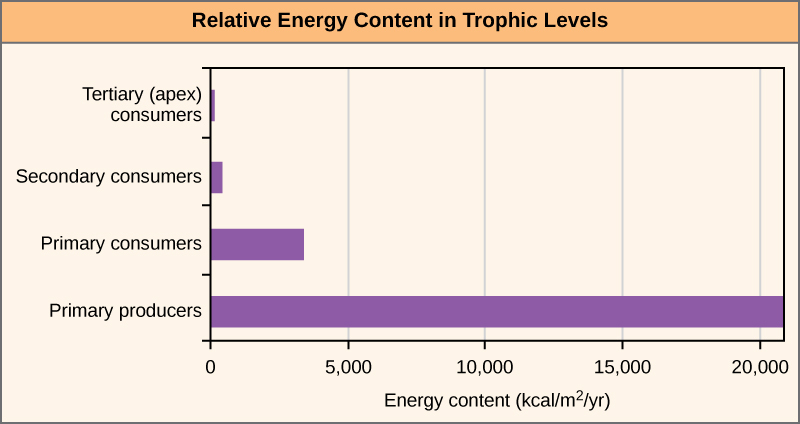 In each successive trophic level, the energy available to the next level decreased significantly. Energy decreases per trophic level: The relative energy in trophic levels in a Silver Springs, Florida, ecosystem is shown. Each trophic level has less energy available and supports fewer organisms at the next level. Two general types of food webs are often shown interacting within a single ecosystem. As an example, a grazing food web has plants or other photosynthetic organisms at its base, followed by herbivores and various carnivores. A detrital food web consists of a base of organisms that feed on decaying organic matter (dead organisms), called decomposers or detritivores. These organisms are usually bacteria or fungi that recycle organic material back into the biotic part of the ecosystem as they themselves are consumed by other organisms. As all ecosystems require a method to recycle material from dead organisms, most grazing food webs have an associated detrital food web. For example, in a meadow ecosystem, plants may support a grazing food web of different organisms, primary and other levels of consumers, while at the same time supporting a detrital food web of bacteria, fungi, and detrivorous invertebrates feeding off dead plants and animals. Many different models are used to study ecosystem dynamics, including holistic, experimental, conceptual, analytical, and simulation models. A holistic ecosystem model quantifies the dynamics of an entire ecosystem. Scientists can use experimental systems, such as a microcosms or mesocosms, to study ecosystems under controlled laboratory conditions. A conceptual model uses flow charts to show the interactions between living and nonliving components of the ecosystem. An analytical model uses simple mathematical formulas to predict the effects of environmental disturbances on an ecosystem’s structure and dynamics. A simulation model predicts the effects of environmental disturbances using complex computer algorithms; they are usually fairly-reliable predictors. Ecosystem dynamics is the study of the changes in ecosystem structure caused by environmental disturbances or by internal forces. Various research methodologies measure ecosystem dynamics. Some ecologists study ecosystems using controlled experimental systems, while some study entire ecosystems in their natural state; others use both approaches. A holistic ecosystem model attempts to quantify the composition, interaction, and dynamics of entire ecosystems. A food web is an example of a holistic ecosystem model, which is the most representative of the ecosystem in its natural state. However, this type of study is limited by time and expense, as well as its limited feasibility to conduct experiments on large natural ecosystems. For these reasons, scientists study ecosystems under more controlled conditions. Experimental systems usually involve either partitioning a part of a natural ecosystem that can be used for experiments, termed a mesocosm, or by re-creating an ecosystem entirely in an indoor or outdoor laboratory environment, which is referred to as a microcosm. A major limitation to these approaches is that removing individual organisms from their natural ecosystem or altering a natural ecosystem through partitioning may change the dynamics of the ecosystem. These changes are often due to differences in species numbers and diversity, but also to environment alterations caused by partitioning (mesocosm) or re-creating (microcosm) the natural habitat. Thus, these types of experiments are not totally predictive of changes that would occur in the ecosystem from which they were gathered. Mesocosm: Greenhouses contribute to mesocosm studies because they allow us to control the environment and, thus, the experiment. The mesocosms in this example, tomato plants, have been placed in a greenhouse to control the air, temperature, water, and light distribution in order to observe the effects when exposed to different amounts of each factor. As both of these approaches have their limitations, some ecologists suggest that results from these experimental systems should be used only in conjunction with holistic ecosystem studies to obtain the most representative data about ecosystem structure, function, and dynamics. Scientists use the data generated by these experimental studies to develop ecosystem models that demonstrate the structure and dynamics of ecosystems. Three basic types of ecosystem modeling are routinely used in research and ecosystem management: conceptual models, analytical models, and simulation models. A conceptual model consists of flow charts to show interactions of different compartments of the living and nonliving components of the ecosystem. A conceptual model describes ecosystem structure and dynamics and shows how environmental disturbances affect the ecosystem, although its ability to predict the effects of these disturbances is limited. Analytical and simulation models are mathematical methods of describing ecosystems that are capable of predicting the effects of potential environmental changes without direct experimentation, although with limitations in accuracy. An analytical model is created using simple mathematical formulas to predict the effects of environmental disturbances on ecosystem structure and dynamics. A simulation model is created using complex computer algorithms to holistically model ecosystems and to predict the effects of environmental disturbances on ecosystem structure and dynamics. Ideally, these models are accurate enough to determine which components of the ecosystem are particularly sensitive to disturbances. They can serve as a guide to ecosystem managers (such as conservation ecologists or fisheries biologists) in the practical maintenance of ecosystem health. Conceptual models describe ecosystem structure, while analytical and simulation models use algorithms to predict ecosystem dynamics. Conceptual models are often flow charts that demonstrate the relationships between different organisms in a community and their environment, including the transfer of energy and nutrients. Analytical models use mathematical equations to predict and describe simple, linear components of ecosystems, such as food chains. Simulation models use computer algorithms to predict ecosystem dynamics; they are considered the most ecologically-realistic and accurate. Conceptual models are useful for describing ecosystem structure and dynamics and for demonstrating the relationships between different organisms in a community and their environment. Conceptual models are usually depicted graphically as flow charts. The organisms and their resources are grouped into specific compartments with arrows showing the relationship and transfer of energy or nutrients between them. These diagrams are sometimes called compartment models. Conceptual model of energy: This conceptual model shows the flow of energy through a spring ecosystem in Silver Springs, Florida. Notice that the energy decreases with each increase in trophic level. Conceptual models are useful for describing ecosystem structure, but are limited by their poor prediction of ecosystem changes. To model the cycling of mineral nutrients, organic and inorganic nutrients are subdivided into those that are bioavailable (ready to be incorporated into biological macromolecules) and those that are not. For example, in a terrestrial ecosystem near a deposit of coal, carbon will be available to the plants of this ecosystem as carbon dioxide gas in a short-term period, not from the carbon-rich coal itself. However, over a longer period, microorganisms capable of digesting coal will incorporate its carbon or release it as natural gas (methane, CH4), changing this unavailable organic source into an available one. Human combustion of fossil fuels accelerates this conversion by releasing large amounts of carbon dioxide into the atmosphere, which may be a large contributor to the rise of the atmospheric carbon dioxide levels in the industrial age. The carbon dioxide released from burning fossil fuels is produced faster than photosynthetic organisms can use it, while the number of photosynthetic trees have decreased because of worldwide deforestation. Most scientists agree that high atmospheric carbon dioxide is a major cause of global climate change. Conceptual models are limited; they poorly predict the consequences of changes in ecosystem species and/or environment. Ecosystems are dynamic entities that are subject to a variety of abiotic and biotic disturbances. In these cases, scientists often use analytical or simulation models. These models predict how ecosystems recover from disturbances, returning to a state of equilibrium. As most ecosystems are subject to periodic disturbances and are often in a state of change, they are usually either moving toward or away from multiple equilibrium states. Since human impact can greatly and rapidly alter the species content and habitat of an ecosystem, it is crucial for scientists to develop models that predict how ecosystems respond to these changes. Analytical models generally work best when dealing with relatively-simple, linear systems; specifically, those that can be accurately described by a set of mathematical equations whose behavior is well known. They are mathematically complex models that are good at predicting components of ecosystems such as food chains. However, their accuracy is limited by their simplification of complex ecosystems. Like analytical models, simulation models use complex algorithms to predict ecosystem dynamics. However, sophisticated computer programs have enabled simulation models to predict responses in complex ecosystems. Simulation models use numerical techniques to solve problems for which analytic solutions are impractical or impossible. These kinds of models tend to be more widely used. They are generally considered more ecologically realistic, while analytic models are valued for their mathematical elegance and explanatory power. These simulations are considered to be the most accurate and predictive of ecosystem dynamics.